The Alleganian newspaper published in Cumberland, Maryland, covered a variety of Civil War related news in 1864. 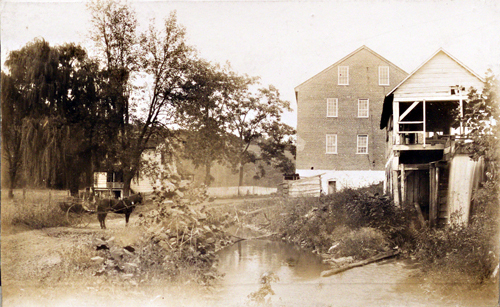 The most significant to the area was the Battle of Folck's Mill, published under the headline The Invasion. The panic in Cumberland prior to the encounter as tensions mounted in anticipation of the arrival of McCausland's troops on their return from the burning of Chambersburg, the gathering of volunteers to defend their town, the battle itself and then the parades and speeches afterwards are all included. The Alleganian also included articles of the Battle of Monocacy, and the burning of Chambersburg. Names of men from Cumberland Market House District, Frostburg, Mount Savage, Grantsville, Westernport, Oldtown, Altamont, Oakland, and Accident included on the draft notice are reported, plus the news that Provost Marshals could receive or accept colored substitutes for white persons. The added comment - "The decision will naturally cause a great reduction of the rates demanded for white substitutes." Also happening in the summer of 1864 were the Maryland State Convention and the vote for a new Maryland constitution. One of the provisions in it was the freeing of slaves in Maryland. The Alleganian reported on how the discussions were progressing and the local result of the referendum. Benjamin Diffenbaugh's memoirs add the perspective of a young boy growing up near Oldtown, whose family has to interact with troops from both sides. Alexander, Ted. "McCausland's raid and the burning of Chambersburg." Thesis, University of Maryland, 1988. Scott, Harold. The Civil War Era in Cumberland, Maryland and nearby Keyser, West Virginia. Cumberland, Md. (12016 Kite Ave., S.W., Cumberland 21502) : H.L. Scott, 2000. Western Maryland Regional Library is grateful to Bob Baldwin and Barbara Browning of the Donald L. Alexander Library at Allegany College of Maryland for making available The Alleganian newspaper. Thanks also to Ted Alexander of Antietam National Battlefield for allowing us to quote from his master's thesis and to the Western Maryland Room for the use of the image of Folck's Mill, and John McGrain and Al Feldstein for the history of the mill. Thanks to MaryJo Price of the Frostburg State University Library for permission to use the Deffinbaugh memoirs from the Journal of the Alleghenies.